This Harley Dyna Wide Glide Trike for Sale by owner is a gorgeous, "Old School", easy-To-ride - LOWRIDER motorcycle that has custom EVERYTHING! It has just 20k (?) miles and has been professionally maintained. The trike has satin black paint with $100s of dollars invested in pinstripes. It looks great, has low miles and is good to go! How would a person go about building a nice trike like this one? The first step would be to start with a stock 2004 Harley Dyna Wideglide and replace the stock front end with a 2011 Daytech 6 degree front end and install a Lehman trike conversion kit on the rear. Give it a custom satin black paint job and be willing to invest big bucks in pinstriping. Mount the 16" red Fat-Daddy, large spoke front wheel with white wall tires ($800). Add 14" ape hangers with all chrome controls and braided lines and a stretched Daytech headlamp and 4 chromed bullet spotlights, HD nostalgic grips and some very price-y (read EXPENSIVE) Cyclesmith banana floorboards for the rider and a red billiard 3 ball shifter and brake pedal. a look at the low profile tour pack with the spoiler on the trike for sale? It's a $600 aftermarket tour pack mounted with the good Harley Davidson mounting hardware. It has reverse but the current pipes block the shifter. I never used it anyway, but if you want reverse, it's got reverse but you will need to change out the exhaust pipes. Another addition ($600) is the saddle rebuilt with memory foam and a red faux alligator inset! It's awesome! 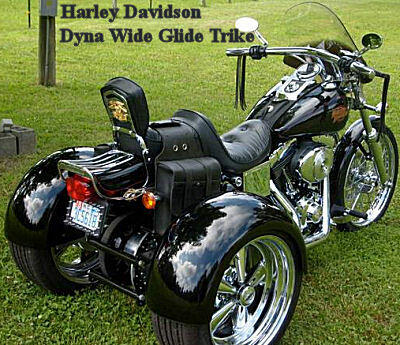 If you would like to write a review or voice any opinions on the Harley Davidson Dyna Wide Glide for sale, you may use the comments form below this ad to do so. Thanks for visiting GoGoCycles Used Motorcycles for Sale and for taking a look at my Harley Dyna Wide Glide Trike for Sale by Owner. The location of the HD trike for sale is Southern California near Sacramento CA and in my opinion my asking price for this nice three wheeler is so low that it can't be beat on Craigslist or Ebay; only $18500 (NO TRADE but serious Offers are appreciated). If you want to take a look or have questions, call me (NO EMAILS) at Nine-5-ONE Five-EIGHT-7 One-1-seven5 for more details and don't forget to mention that you found this ad on GoGoCycles Used Motorcycles and Parts for Sale www.gogocycles.com.